Growing up, I did nerdy things. I played the violin, I was in a couple of honor societies, and I almost got a D in gym class one quarter because it was early in the morning and I often showed up 20 minutes late, or not at all. It should thus come as no surprise that I am terrible at doing cool sports tricks, like spinning a basketball on my finger. 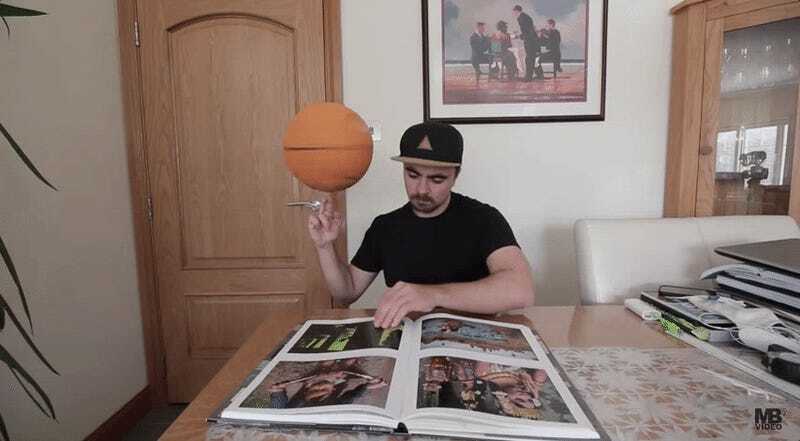 But today, this video popped up with the title “Learn to Spin a Basketball.” Perfect, I thought. All my cool kid sports dreams were about to come true! So I borrowed a basketball from my friends at Deadspin and gave it a whirl, as it were. Unfortunately, even after watching this video twice, I still can’t spin a basketball on my finger for more than .3 seconds. (This is not surprising.) To be fair, it took the video’s star Mike Boyd a little over four and a half hours to meet his requirement—spinning the ball for at least 30 seconds—and I tried for, like, 10 minutes. But still—disappointment central. My cool kid sports dreams are still dead, but maybe yours will fare better.